The first of the three “Museum of the Future” debates at the British Museum last week, which focus on the future of the institution, this time specifically the building itself, was a fascinating affair. Initially at risk of being misappropriated as an open forum for some “Friends of the Museum” to air their often impractical, and at one point absurdly unethical grievances, the conversation was expertly steered by the wonderful Liz Forgan towards a lively and engaging discussion. Within it, an issue coined as “Welcome vs. Awe” chimed a particular resonance with me. Arriving at the British Museum for the first time since I was 15 years old, my memory of the exterior of the building served me particularly hazily and I must admit that my re-acquaintance with it was somewhat jarring. Much was made of the perimeter railings of the British Museum by the debate panel, not least from Bonnie Greer who revealed that she has long dreamed of their removal. Austere despite their aesthetic beauty, I would disagree with her stance however as I feel they suit both an ideological, as well as a practical purpose. The British Museum is, has always been, and will always be, “a museum of the world, for the world.” For this reason, I like to view the site as something separate from the city, an extraterritoriality, international ground, and for me the railings help make this distinction. Their strong fortification forcibly holds back the ever-swelling city, preserving the museum as a distinct and visible island of antiquity, effortlessly resistant to the swirling London tides. Instead, it was what follows the gates that perturbed me. Despite the noisy bustle of people who mill around in the courtyard, there is a deafening emptiness to it. This is hampered further by the colourlessness of the British Museum’s spectacular façade, punctuated only by two advertisement banners which are too disproportionately small to be of any consequence to their environs. The problem with this is simple, I felt far away. In addition to this, the doorway is very small, and everything from the two front lawns that flank the pathway to it, the twelve steps up to it, or the columns that frame it, intensify the tapering of your line of sight, pushing the doorway further and further into the distance. On top of this, even once the visitor has made their pilgrimage down the path, up the steps and through the door, they are funnelled into the Queen Elizabeth II Great Court. A visually spectacular setting once more, but again one that leaves a sense of cavernous emptiness. Surrounded by people resting at cafes or perusing gift shops, I felt like I was at the end of my journey, not the beginning. From the moment I crossed the threshold of the British Museum gates, I felt as if a large, steely hand had been placed on my chest, forcefully resisting my advances towards its wonders, hoarding its collection behind its back and keeping me always at an arms length from its discovery. “Awe” there unquestionably is, but “welcome” is much less apparent. This issue of “welcome,” or lack thereof, was best highlighted by a lady in the audience who recounted the tale of a youngster who once told her that they “didn’t know they were allowed” inside the British Museum. The grand stateliness of Robert Smirke’s Greek revivalist façade is potentially an issue. The architectural intent behind museum entrances of this kind was that they are designed to literally “elevate” the visitor above their natural station. To lift them up off the street, and into a space between the earth and the heavens within which to wonder and admire at the art and antiquity that was at home there. Because of this, these museums and their contents are above the people, always. The National Museum of Scotland however remedied a similar problem during their 2011 refurbishment by simply, yet boldly, sealing off their traditional entrance. Instead, the doorways now sit either side of the stairs that used to lead to them, at street level. I have always been fascinated by the alley-dwelling houses of central Washington D.C. Once used as slum residences to literally “hide” the free black population migrating from the south, the confined space meant that there was no room to separate the home from the street, not even for pavements, so the front doors opened directly onto the road. Now these houses are upmarket “artisan” dwellings, and in an attempt to generate a modicum of privacy, owners are adding a front step to their doorways. These steps create some space between the homes and the world outside them. A small touch and hardly noticeable, yet hugely effective. A single step can create a sense of privacy. The British Museum has twelve, and the National Museum of Scotland has even more than that. The Edinburgh museum, like the Washington homeowners, realised this, and they did exactly the opposite. They negated their steps and brought their doorways out onto the street, out to the people and the world outside. The grand staircase of course remains, so “awe” is not sacrificed, it remains unblemished, yet a sense of “welcome” is now instilled. These entrances are also made of glass, willingly revealing everything beyond them, and they open automatically, welcoming any and all who approach them. A small touch and hardly noticeable, yet hugely effective. I am not suggesting the door to the British Museum be moved out onto the pavement of course, the building cannot be moved closer to the street, but what is to stop the collection from doing so? I felt Sir Antony Gormley’s discussion of the courtyard as an underused space was particularly salient. There must be objects in the collection that can be exhibited out there, or the museum surely has the ability to construct display cases suited to such an environment. The British Museum can push the boundaries of how it exhibits its collection, by literally pushing it to the boundaries of its estate. Rather than funnel its visitors directly into ever-increasingly overcrowded galleries, the visit should begin at the gate, at street level, not at the front door. This too would help soften the image of the railings by ensuring people, such as the young child mentioned earlier, are reassured without explanation that they are there to protect a public collection, not just an intimidating building. 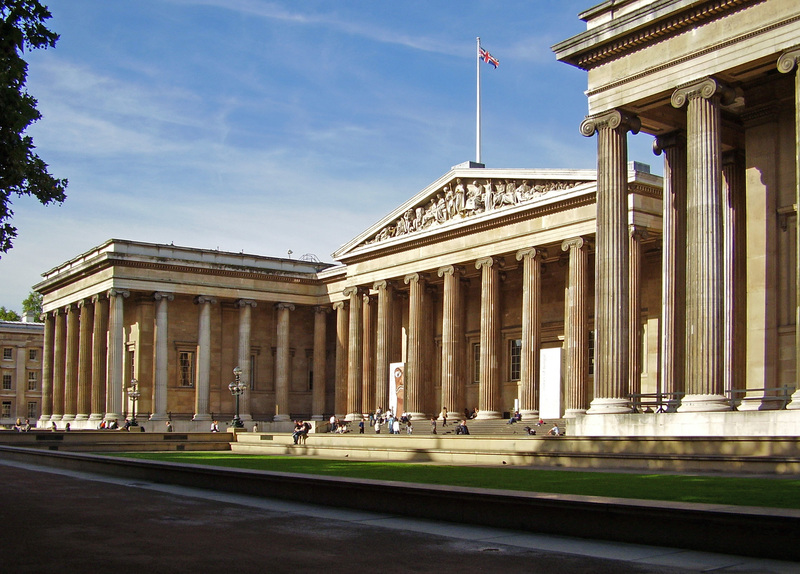 Gormley also suggested that the British Museum could benefit from having more entrance points, alleviating bottlenecks and overcrowding, and allowing visitors to better curate their own experiences by targeting specific galleries and exhibitions. The National Museum of Scotland has three different doorways on one street now and they serve just such a purpose. Surely the British Museum could do something similar? Unlike the Edinburgh museum, it has the geographical privilege of being accessible from all sides, so to fail to make use of this seems wasteful. For me, the museum is not the storyteller, the visitor is. The museum is the facilitator, and the setting in which millions of different journeys can take place, and millions of different stories can be told every single year. The more entrances a museum has, the more beginnings a story can have. The British Museum is uniquely positioned to provide these opportunities for intensely personal, intensely individual visitor experiences. As noted earlier, these stories should absolutely begin from the moment a visitor steps through the museum gate. Should courtyard exhibits be used, they should be used to signpost these different entry points. They should be thematically positioned to guide visitors in the direction of the doorway that will interest them most. Instead of forcing visitors down a narrow channel, the courtyard could become a series of estuaries, welcoming the visitor to steer themselves into the current of their choice, and carve out their own individual, unique narrative paths through the landscape of the British Museum. Debate panelist Wim Pijbes, director of Amsterdam’s Rijksmuseum summed the issue up entirely with just one word, “openness.” To cope with ever increasing visitor numbers, and to ensure that the museum is as welcoming as it is undeniably awesome, the British Museum simply needs more “openness.” It should open more doors to let the people flow in, and if possible, allow the collection to flow out. By creating a more permeable structure in respect to the public and the objects, the British museum will provide itself with a living building, a building for the future. This is a really interesting post, the debate sounds like it was a very thought provoking session. I agree with the points made about the courtyard, it is a very underused space, but when it is utilised it’s usually done very well for example when the Vikings exhibition was on there was a recreated long boat sitting there, and there used to be a collaborative effort with Kew to create a themed garden on one of the lawns. The Great Court is an odd space, visually impressive, but vast and echo-y. Muchm much more could be made of it (but not another cafe or shop please). Will you be going to the other sessions? Thanks man. That’s really interesting actually, having not seen the building apart from in textbooks for the last 10 years I could only really go on my experience of it on Thursday for this, and obviously the opinion of the panel which was generally that it was underused. I assumed that this view was hardly a revelation but I hadn’t realised such inventive uses had been found for it already. I guess the issue with permanently exhibiting in the courtyard, as I suggested, is that they wouldn’t allow themselves to be able to offer “showpiece” installations such as the Viking longboat. I think finding a balance between these would be preferable because it definitely suffers in these “down periods” where there is nothing to see. Definitely more food for thought there. As for the kew gardens, I do find myself resistant to that as a solution. While front steps create space and privacy, “front gardens” do so tenfold. I think a heavily landscaped and gardened lawn would only add further “awe” and hinder any perception of “welcome.” This could be a solution to the great court issue (it does look like an empty hot house after all). I’ve seen old photos of the Kelvingrove here where there are huge plants in the main hall and I feel it looked far livelier back then than it does now. The debate really was excellent though. I have tickets for the next one in October but whether I can afford the trip down from Glasgow is still an issue. Are you planning to go to any?